Super soft, EXCELLENT quality, washes really well (incredibly soft after dryer sheets! ), works well with all patterns! However they have a soft denim look to the set, it's not a solid light blue, but still pretty! Just FYI! The Madison Park Essentials Braydon Reversible Duvet Cover 3-Piece Set gives your bedroom a fresh casual update. Sporting a blue striped pattern, the duvet cover and sham reverse to a solid blue allowing you to mix and match styles for the perfect look. Machine washable, this reversible duvet cover is made from yarn dyed fabric in a heathered print style that gives it an incredibly soft hand feel. Comforter insert not included. I am OBSESSED with this bedding!! I couldn’t believe the price, it was so good that it made me hesitant to purchase, but I can’t rave about this set enough! It’s incredibly soft and just so beautiful. The material feels so good, you just want to roll around in it! There were quite a few loose threads, so I’m praying that is no indication of the quality overtime, because I am seriously just obsessed with these!! 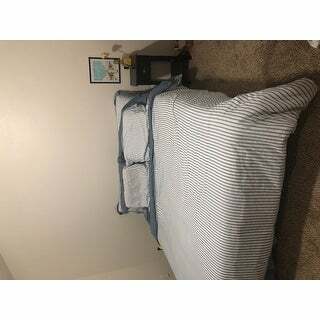 I paired the set with blue sheets that happened to match PERFECTLY and the Brookside chambray down alternative comforter set also found on this site— I don’t know how it’s possible these are two different brands because the two sets match EXACTLY! Very soft! Just like the pictures-much easier than I thought to get the duvet into the cover. A favorite of mine for the spring. The denim blue color is pretty but hard to match. Went with plain white sheets. The duvet cover is a perfect size for the comforter. No extra material so the comforter can't move around inside and bunch up. Held up very well so far. The fabric is extremely soft, and both sides look great as the top cover. Great set of sheets. Such soft fabric. Like silky. If you get a twin you need a full/queen insert. Happy with the look and feel of the fabric. Didn't have any issues with wrinkles or the comforter bunching. My only complaint would be that the edges have a lot of loose strings, which makes me unsure of how long it will hold up. But overall pleased with the purchase. Wish it was a little longer. Slightly short on my queen bed. Also, I would recommend this only if you have a fluffy comforter. I used it with a cheap thin comforter and the duvet ended up being pretty empty. I was disappointed in the quality of this purchase. I love it, fits like a glove. It's soft. Very thin material and stitching came out from zipper. Not impressed.